This weekend we think it’s safe to say it’s official: Spring is here! The weather was warm, the sun was shining, and we were inspired to stay home and get the yard ready for Spring. Last year, I wrote about how excited I was about the prospect of planting seeds in the yard and growing our very own crops right out our back door. We wrote all about pretty food gardens and how fun that was going to be. And, yup. It was pretty. Those sweet, lovely 4×4 boxes looked really nice with their fresh soil. All. Summer. Long. We seriously had like two green sprigs — pretty cute carrots. But not much to show for all that hard work. We blamed little Will, mostly because it’s easy to blame an 18-month old. And partially because his two favorite activities were stirring the garden with his little trowel and watering it with his watering can a little more often than necessary. We also blamed the spot in our yard for not having enough sunlight. The soil for not having enough depth. Pretty much everything we could think to blame except ourselves. So, yesterday, we decided to take the plunge again. Little Will only wanted to plant pears and purple plums. So he’s going to be pretty bummed at the spinach, lettuce, kale and carrots that start (hopefully) popping up instead. And we’re pretty hopeful this year because, he’s very restrained with the stirring/watering, we moved the boxes to a sunnier spot, we used tons more soil and, oh yeah, we realized that last year we put in enough seeds for probably 50 acres. They will be the perfect place to curl up on a garden bench and dream about picking our beautiful produce. We get super overzealous every year when we do this, thinking that we’ve totally got this knocked now, that we are going to become master gardeners, living off the land, probably with a chicken coop stashed in some far corner of the yard. I imagine myself Gwyneth Paltrow-esque, picking my salad ingredients straight from my garden, everyone in the family taking part in the ritual and living off the land. I convince myself that I absolutely must have a garden shed for all of the lovely tools I’m going to need. 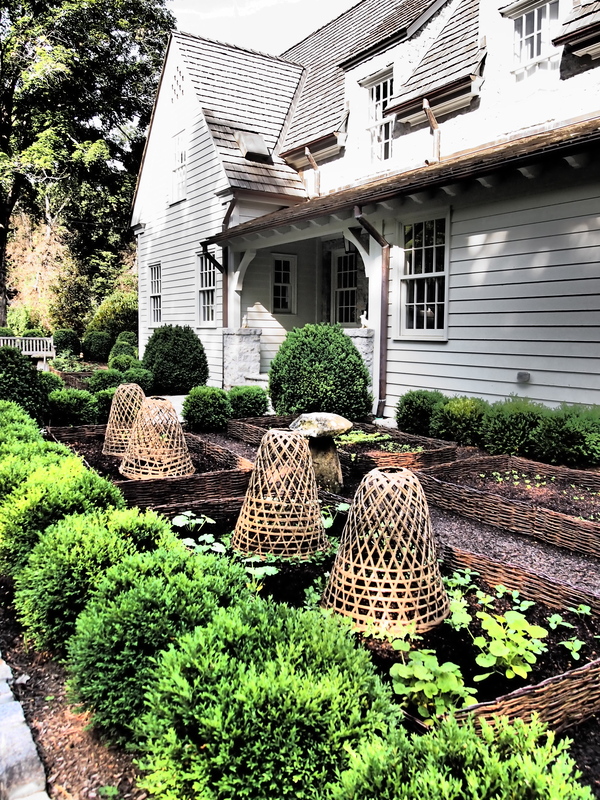 Wow, what beautifully tended gardens…….I love the planting beds that look like wicker baskets! Great charts on vegetable growing too! Thanks much! Oh how i wish i could find some of those better looking “keep out” urn baskets and wire cages. My cages are aweful I have to work so hard to keep the birds and squirrels from eating my hard work. Thanks for the charts and enjoy your garden and keep us posted on your process. Gorgeous gardens! I hope you have success this year and applaud your efforts – there must be some sort of reward for all of that hard work, even if it’s actual produce or not, right? Here’s hoping you have enough veggies that you have to have your own stall at the farm stand to get rid of them all! Beautiful gardens! Lots of inspirations! Good for you! I’m impressed. We have several friends here that are doing chickens and love it. Thank you for sharing all the beautiful gardens. Be it small or grand there is no greater sense of pride when you put on the table a culinary delight grown by planting and patience of love along with flowers from your garden. Oh yes, luscious and well waited for Spring is finally here. Oh what wonderful plans! Good luck and keep us posted!!! I can help with weeds….I’m good with them. I love some of these examples. We have enough sun in our yard for the herbs I cook with and that is all. But when I’m old, and retire to a Martha Stewart-like farm, I’ll need these images to get my inspiration. By the way, one of the most fun things we planted when I visited my granddaughter one Easter, was jelly beans that magically grew a foil wrapped bunny in their herb garden! Will might enjoy trying that…kind of like magic beans. Such beautiful images! I always think I am going to grow a bunch of vegetables, and then, I’m lucky if I plant one tomato plant and some herbs! Thanks so much for featuring my kitchen garden and bulb forcing- I loved the article and especially the charts! Now if I could just find the time to plant! love the garden and garden beds, can someone tell me about the baskets, are they hollow at the bottom, not sure what they did. the stones are they considered impervious is that why they were put down. i am very interested to find out. How inspiring. I would also love to know a source for the woven garden bed sides! Attractive, and look as if they would be very functional. Great post – and I copied your planting guides. We are planning a fall garden this year. How do y’all reach into my head and pick exactly what I love? It’s uncanny. And that’s on every post.